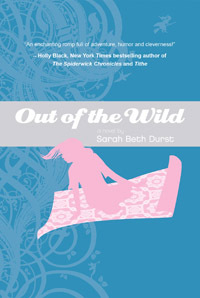 Sarah Beth Durst’s debut novel is Into the Wild, and its sequel, Out of the Wild, comes out this summer. If you were in The Wild, which story do you think it would put you in? Which story would you want to be in? Ooh… I’d love to be Beauty in “Beauty and the Beast.” Specifically, I’d want to be in the Robin McKinley retelling, in which Beauty has access to this phenomenal library that includes all the books ever written and ever to-be-written. I wouldn’t want to be trapped in the Disney version. I love talking cutlery as much as the next person, but Gaston is not someone I ever want to meet. If the Wild trapped me inside a fairy tale without my consent… it would probably make me lady-in-waiting #8 or some other nondescript minor character. Actually, now that I think about it, that kind of sounds ideal: you get access to the full buffet at the balls but don’t have to suffer through glass slippers, poisoned apples, imprisonment, or other fairy-tale indignities. Which part of the book was the hardest to write? Which was your favorite? I think I rewrote the last chapter about three billion times. I just didn’t want to say good-bye to these characters! (Once I knew I’d be doing a sequel, saying good-bye was easier.) As far as my favorite part… ooh, that’s tough. If I had to choose… I’d say I had the most fun with the hair salon scene. I could have just kept going with that until I had Steel Magnolias with fairy-tale characters. Julie would have objected, though, seeing as how it’s her story and she’s not in that scene. Seeing as many fairy tales are about finding “true love”, will Julie find anyone in Out of the Wild? 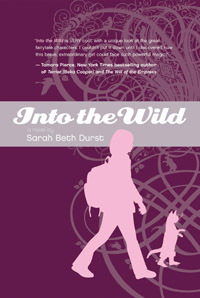 Would you ever write a book about The Wild from another point of view like Gillian, Zel, Gothel, or even the Wild? I think that would be cool, but I don’t have any specific plans. Do you have any other books planned that are not about the Wild? Tamora Pierce, Robin McKinley, Charles de Lint, Holly Black, Diane Duane… Anyone who writes about talking cats. One to two years. It takes me about two months to write a first draft (a really horrifically bad first draft) and then I spend the rest of the time on drafts 2 through 902. I was able to write Out of the Wild in half the time that it took me to write Into the Wild — I think this was because I already knew the characters and their world. Or maybe I’m just getting faster. I hope that’s the case! Does Gillian reappear in Out of the Wild? What distracts you most from writing? My brain. It gets distracted by shiny things. Seriously, the answer really is my brain. It can distract me by being overly critical too early in the writing process. My trick is to turn on music. My brain starts humming along with the tune, and then I can get some actual work done. Have you always liked to read and write? Yes! I have always, always loved books. Some of my earliest and best memories are of visiting the library with my mom and my brother and coming home with an enormous tower of books. I’ve always thought of books as magic. Whole worlds contained inside a little rectangular object! For as long as I can remember, I’ve wanted to be part of that magic — to be a writer. I’ve never wanted to be anything else. Wild Magic, Deep Wizardry, Ella Enchanted, Pride & Prejudice, Ender’s Game, Howl’s Moving Castle, Dragonsinger, The Blue Sword, Beauty, Jack the Giant-Killer, The Dark is Rising, The Girl With the Silver Eyes, A Fistful of Sky, Harry Potter and the Sorcerer’s Stone, A Wrinkle in Time… I’m drawn to books that feature a girl with a sword, a girl with a dragon, a girl with a talking horse, a girl with… etc. What’s your writing process? 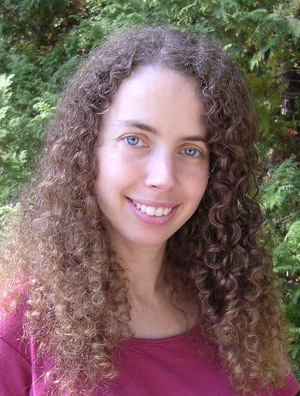 Do you outline extensively or see where the story goes? Once I have my outline, I write my first draft as quickly as humanly possible. The reason for this is that I hate writing the first draft. I find first drafts to be horribly painful because… well, it’s like this: you start with this idea that feels so awesome and perfect in your head and then the second you put a word down, it’s no longer perfect. I love revisions because with revising, you can see the story improving and you can feel it moving closer to that original idea that you fell in love with. But it is different for every writer. I know lots of writers who hate outlines and lots who love first drafts. I think the important thing is to figure out what works for you and then trust your own process. And eat a lot of chocolate. Chocolate definitely helps. Great interview! I quite enjoyed reading it. Into The Wild is amazing. Great interview! Sarah Beth is so fun.